Another busy Saturday!! Only 55 College Football games to handicap!!! Betting is 78% on the home Favorite Michigan State with the line moving from -6 to -3.5. Models are neutral, Variables favor Wisconsin and public betting favors Wisconsin. However if your thinking about betting Wisconsin it looks to me like your late to the party. That is a pretty large move from +6 to +3.5. Typically unless there is something built into the move like an injury(which I do not see here) its a bit late to start betting Wisconsin. For me the game would be a pass for that exact reason. Friday we had a one unit play in MLB with Tampa Bay +105 which lost 1-2. Its funny when you get on a nice winning streak like we have been having in MLB you think your going to win every game. In the Tampa game even down 2-1 going into the bottom of the 9th I felt they might pull it out. And then a lead off double got me excited! But that was it a pop up and two strike outs and it was over. One game big move our way with the other about unchanged. Its really uncanny how accurate these are in predicting line moves. And not just 1 or 2 pts but sometimes 10 to 30 point moves. If your handicapping yourself this information is invaluable. This is what the big handicappers (5,000 a game and higher) pay big bucks to get. I have been asked if I have any predictive models for the other sports for line moves. I have nothing even comes close to MLB. Although in the NFL and to a lesser degree in College Football the pendulum has shifted dramatically to the moves going with the “sharps” as opposed to the public. If you have a game say where 80% of the public is on a side its a very high probability that the line will move say from -10 to -9 as an example rather then the line getting higher. Five or six years ago (the good ole days) the lines would skyrocket with the public betting. You could wait up until game time if you were a dog bettor and almost be assured of getting a much better line. In some instances steam would move games by 5 pts. Not anymore. Its a very rare occurrence that the public moves the lines much. Now its the “sharps” that are pounding the lines and the books not only are making a better line upfront but are reluctant to move the line with the public knowing they are going to get pounded by “sharps”. Its very interesting to see the dynamics at work between 1. public 2. Bookmaker 3. sharps!!! Once you get the dynamics right you can then be in a better position to evaluate the line. I get asked about 60 to 100 times a year as to why I do not handicap games commenting on the player match ups. 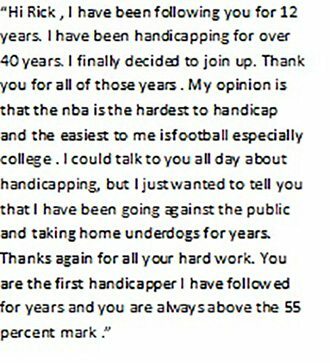 Unless your in the 1/10th of 1% of the handicapping population that can evaluate games better than the books using that method its a real time waister that usually heads you in the wrong direction. Also if you are in that 1/10th of 1% most are still using many of the methods I use with their match up ability. I have to say its very interesting to read the expositions about quarterback match ups and every other match up but the reality is like I said if your trying to find positive ev thats not the approach to go. I know its counterintuitive to think that but its one of those “givens” I mention from time to time. 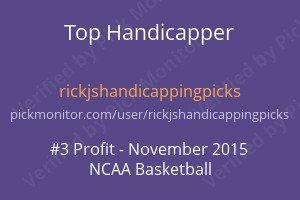 You can take it as an absolute truth for 99% of the handicappers. Thats my ramble for this morning. Its going to be a busy Saturday. Hope to see you join our group!